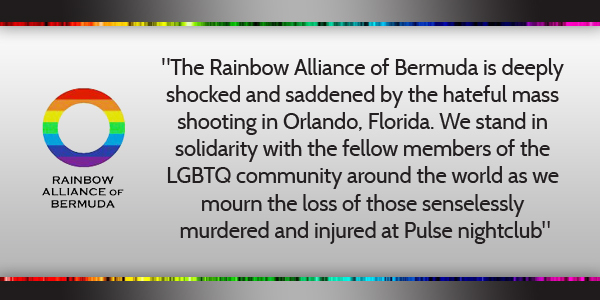 The statement from the group said, “The Rainbow Alliance of Bermuda is deeply shocked and saddened by the hateful mass shooting in Orlando, Florida. “We stand in solidarity with the fellow members of the LGBTQ [lesbian, gay, bisexual, transgender, queer] community around the world as we mourn the loss of those senselessly murdered and injured at Pulse nightclub, a safe space for the gay community. “Our thoughts are with their loved ones, spouses, partners, parents, children, families and friends. “In a small community like Bermuda, we know how important it is to cultivate safer spaces where LGBTQ people can feel free to express their true selves. It is a shocking violation for those spaces to be brutalized with homophobic and transphobic violence. “This attack was not only on the individuals at Pulse, but also against the global LGBTQ community during the month of Pride. “This attack was also not solely the result of one man’s gun, but the end result of systems and cultures that spread homophobia and transphobia. When LGBTQ people are seen as less-than-human, as not deserving equal human rights and respect, a target is painted on our backs. “In Bermuda, we need to tackle these systemic roots of homophobic violence, to see each other all as equals deserving of equal rights, if we truly want to stand in solidarity with the victims of this shooting. “The Pulse massacre is heartbreaking. The Rainbow Alliance of Bermuda would like to remind our LGBTQ community and allies that we do not tolerate hate, Islamophobia, or religion-bashing. For us to be free, we must fight our battles intersectionally. Lots of prayers were prayed for the victims and their families at Sunday’s prayer vigil. God’s be with the victims and their families. Coming from you and the things you have said about LGBT, I find this very insincere. And yet, you will continue to post lies and misinformation in a cowardly attempt to promote your hateful campaign of discrimination, treating the LGBT community as less than human and unworthy of sharing in rights. It would be nice to believe that, but since you were out there to to pray that these same people’s remain as second class citizens, in your view lower than you and undeserving of the same rights and protection under the law that you take for granted. Your ‘prayers’ become disingenuous, hollow and hypocritical to those who suffered from this senseless violence… not just in Orlando, but around the world, at the hands of those that use your same belief/prayers and misinformation that you yourself have promoted on these comment pages to justify and inflict these crimes. Your intolerance is what fuels this violence and crimes, it is intolerance that has eroded our social and familial fabric of our communities. What a load of shite. Not one single mention was made of any of these prayers. And given how bad it was that this homophobic display went ahead on the day of the tragedy I am absolutely sure that the various Reverends interviewed would have featured this prominently. Nice try at damage control but it is NOT believable! If we waited until every person in the world was ready to be tolerant to equality of right under the law, then nobody would have any human rights at this time. Evolution has to happen, and those that can’t keep up will fall behind, and sadly too often rest like this to their failure to keep up. *sadly results like this is born from their failure to keep up. Is it too far-fetched or cynical to believe that this must be another ploy to take away the American’s right to possess a firearm? Yes. Because no one is trying to do that. At all. Sensible gun laws aren’t “taking away American’s right to possess a firearm”. No one is proposing that. have you seen the stories in the NY Post and UK papers that say that the shooter was gay, visited gay clubs for years, hit on gay men, and his ex-wife said he was gay? To think that any one would be willing sacrifice 50+ lives as part of ‘another ploy’ is just so utterly barbaric to even contemplate. Yet, that’s where you went. I’m gonna go out on a limb and say that history wasn’t your major in college. Get your tin foil hat back on. How anyone who lived through segregation and the civil rights movement is able to sit there and preach acceptance while simultaneously denying the very same rights that blacks in the past have been denied (and fought for) is beyond me. The hypocrisy of some people is so extensive that they don’t even realize, and it’s sad, honestly. I support SSM but don’t dare act like gay people have had to endure the oppression that BLACK PEOPLE, THE ORIGINAL PEOPLE, have endured and continue to endure for the past 500 years. But they have and continue to endure abuses, in some places that are systematic, there are places in the world where they are burnt alive, hung, tortured. They have been subjected to involuntary lobotomies, chemical castration, imprisonment in pyshiatric institutions and not to forget the current ‘conversion therapy’ treatment centres that are widely regarded by the scientific community as a form of psychology abuse. The persecution in the west even predates the establishment of the western slave trade. Is the LGBT community currently enduring slavery? How about gay only public water fountains? gay seating section at the back of the bus?? Do you see “no gays allowed” signs at restaurants, stores or movie theaters? gay only segregated neignourhoods? Gay only segregated schools? gay only segregated hospitals? Gay only segregated platoons in the army? Access to menial jobs only? DO NOT compare your plight to that of the civil rights movement. To equate lgbt discrimination with racial discrimination of a people forcibly brought to the western world in captivity is about as racist as it gets. You don’t even realize apparently. I’m sorry, did I miss when gay people were sold as slaves? When were they hung from trees and photographed hanging there, etc. Stop trying to play the victim, because you aren’t one! OOOH! That was a good one. Do you really have nothing to add? Is THIS how you have a conversation? Pathetic, childish “Oooh, you’re gay!” allegations, too cowardly to come out and actually say it? I’m a heterosexual married women. Myself and my husband stand in solidarity with the LGBT community around the world at this sad and devastating time. We will also stand in solidarity with the LGBT community of Bermuda on the 23rd of June. When hopefully you will all get what should be rightfully yours anyway!